If you have never been in a car wreck, then you might be surprised by how long it takes to recover. The recovery process is lengthy because our bodies are not equipped to withstand strong forces, like whiplash. 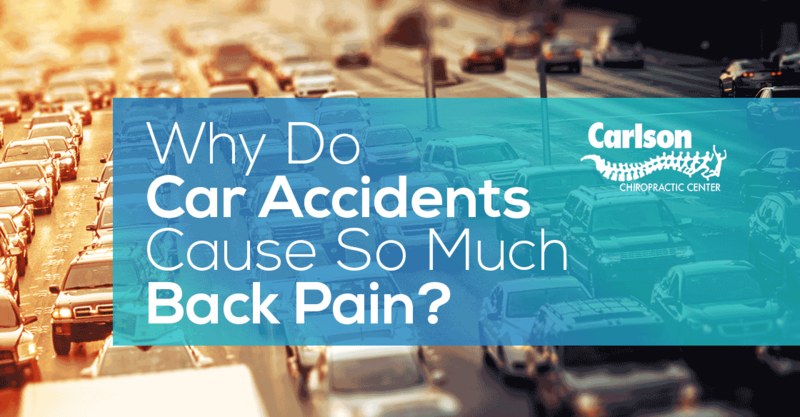 The changes in velocity of a car accident wreak havoc on our joints and muscles. When your neck is thrown in multiple directions, the muscles from the opposite side pull and strain from the force. This causes adhesions to form between the muscle fibers while the body is trying to recover. The swelling and adhesions make it difficult to turn your head, move your wrists, bend forward at the waist, etc. If this soft tissue damage is not treated, it can lead to long term arthritic issues. TIRED OF SUFFERING FROM A BULGING DISC? DOWNLOAD OUR FREE GUIDE ON SPINAL DECOMPRESSION. It is best to try to treat these injuries as soon as possible. If you are in severe pain with potential life threatening injuries, of course we recommend seeking medical attention at a hospital. If possible, ice the injury as soon as you can. Contact Carlson Chiropractic to schedule an appointment for further evaluation. Soft tissue techniques restore the regular movement in the tissue and joints by breaking up scar tissue and loosening the muscle contractures. Adjustments are important when it comes to motor vehicle accidents to help restore normal mobility to the injured area. We have observed over the years that people sometimes don’t experience pain from a car wreck until weeks later. So please don’t hesitate to call 417-781-6300 for more advice if you or anyone you know is suffering from these types of injuries. Don’t let a car wreck change your health forever.